WASHINGTON, D.C. – June 17, 2015 – (RealEstateRama) — AMSEC LLC, which provides technical services, IT solutions, maintenance and more to the U.S. Navy and various Defense Department and commercial clients, has renewed its lease and is upgrading its offices at the NetCenter on Mercury Boulevard. Expected to begin this fall, the upgrade will help house approximately 375 engineers, logisticians, training instructors and IT professionals. Hampton Mayor George Wallace called AMSEC’s commitment very good news for the city. Headquartered in Virginia Beach, AMSEC is a subsidiary of Huntington Ingalls Industries, which also owns Newport News Shipbuilding. The Offices at NetCenter is the largest office complex in Hampton Roads and is home to several technology-related companies. The 500,000 square foot building features a central two-story atrium with a dome glass ceiling and numerous skylights throughout the common areas. NetCenter opened in 2000 and was acquired by American Real Estate Partners and Square Mile Capital Management LLC in 2013. “The partnership is delighted that AMSEC has shown its faith in our company by renewing its lease. We view our relationship with AMSEC as a partnership where our job is to contribute to AMSEC’s future success,” said American Real Estate Partners Principal Michael Gribbon. NetCenter is located within a Virginia Enterprise Zone. Hampton’s Economic Development Authority on Tuesday awarded AMSEC LLC a grant of up to $118,000 for retaining and upgrading their Hampton office and hiring additional employees at the 62,000-square-foot facility. For more information about AMSEC, go to www.amsec.com. 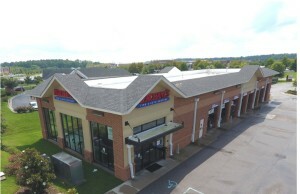 For more information about American Real Estate Partners, please review the firms’ website at www.americanrepartners.com.